JBL is a trusted name in the Bluetooth speaker game, and its Pulse 3 speaker is one of the more visually pleasing ones available today. While it's not the only Bluetooth speaker touting a colorful light show, it's certainly the best-looking of the bunch. 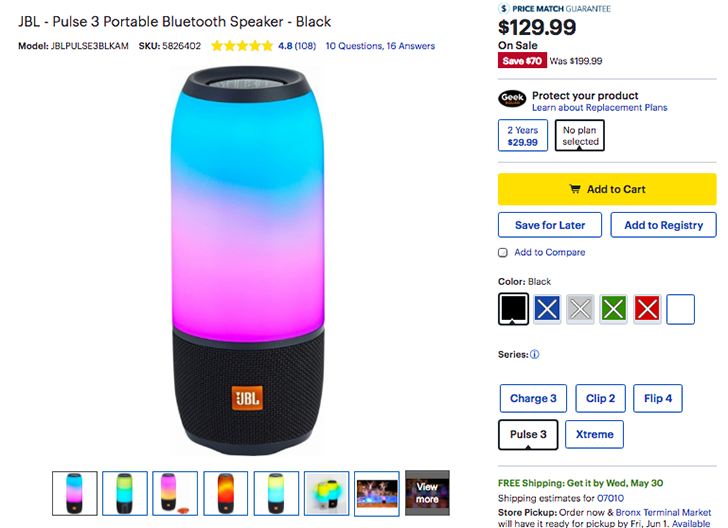 Now you can get a JBL Pulse 3 for $129.99 at Best Buy, which is $70 off the normal price and the lowest we've seen this product go for. The cylindrical Pulse 3 has a robust list of features, including the aforementioned customizable, 360-degree light show utilizing glowing LEDs; 360-degree sound; IPX7 water resistance; a rechargeable battery promising up to 12 hours of playtime; and Connect+ technology, which means it can link with up to 100 other JBL speakers with Connect+ enabled. There's also noise and echo cancellation for the speakerphone when you make calls, and access to Google Now and Siri at the touch of a button. Only the black version of the Pulse 3 is available for $129.99 at Best Buy right now; the white version is available for $169.99, which appears to be around the standard going price for this speaker at the moment. Again, this is better than other deals we've seen for the Pulse 3, so act now if you're interested. Weekend poll: Will you be buying a OnePlus 6?